Darryl Carter is on a mission to lighten up our homes - colorwise, that is! He recently designed this beautiful and classic kitchen, which is part of a massive renovation for a Washington D.C. couple. Check out all the gorgeousness of this great house over at Mark D. Sikes beautiful blog here. 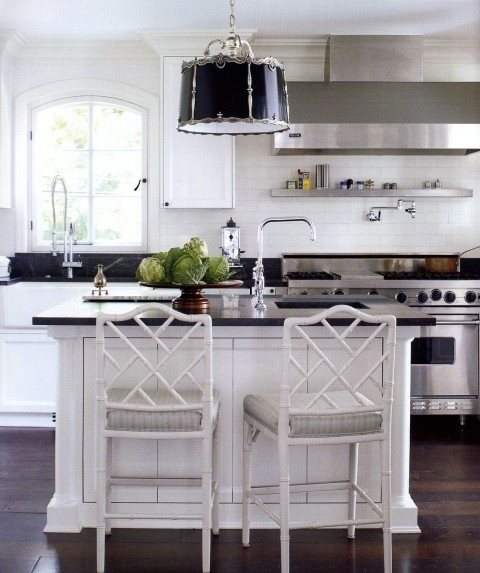 I love that fabulous light fixture with those black marble counters, don't you? Carter recently released a new paint palette in his usual understated, yet stunning, hues through Benjamin Moore. Got your own Carter crush? Head on over to his website at darrylcarter.com. Daily dose of cuteness: Nola!